I've diagramed what I'm trying to achieve with my network, but I have a few questions as I'm a newbie when it comes to networking. I am having a hard time understanding the ins and outs of networking and the equipment. Currently I only have my router (ASUS RT-AC88U) connected to my modem, and a NAS (DS 718+) connected to my ASUS router. 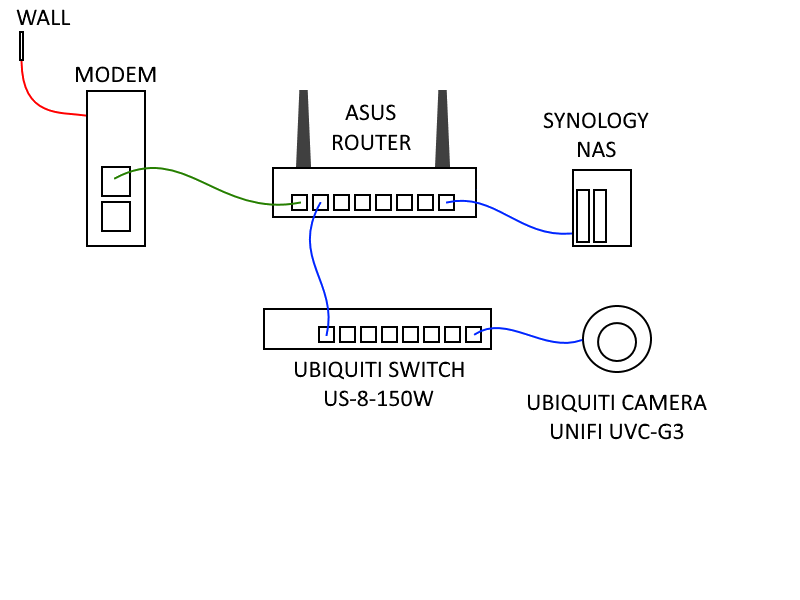 I'd like to implement a switch (Ubiquiti US-8-150W) into my network so that I can also connect a Unifi G3 Camera, as well as a TV, printer, and possibly other equipement down the line. 1.) Is the diagram I created the correct way of going about this? 2.) Can I and/or do I need to use the Unifi Controller software for such a setup? Will there be conflicts betweeen my ASUS router software and the Unifi controller software? Will the firewalls conflict or would my network become vulnerable? 3). Should my NAS, or any other equipment, only connect to the switch? In other words, can I mix and match connecting some equipment to the switch and others to the router? If so, would ASUS router software and Unifi software clash? 1. Yes. This would work. 2. In this senario, the unifi switch is overkill. Any generic POE switch should work. To get the most out of this, you would need the cloud key software running on a PC / Rasberry Pi. I think there is a way to get it to run on a Synology NAS using Docker. 3. There would be no issues mixing different equipment.